I will always be grateful for the five years I spent as faculty member teaching yoga at the Los Angeles Ballet Summer Intensive. 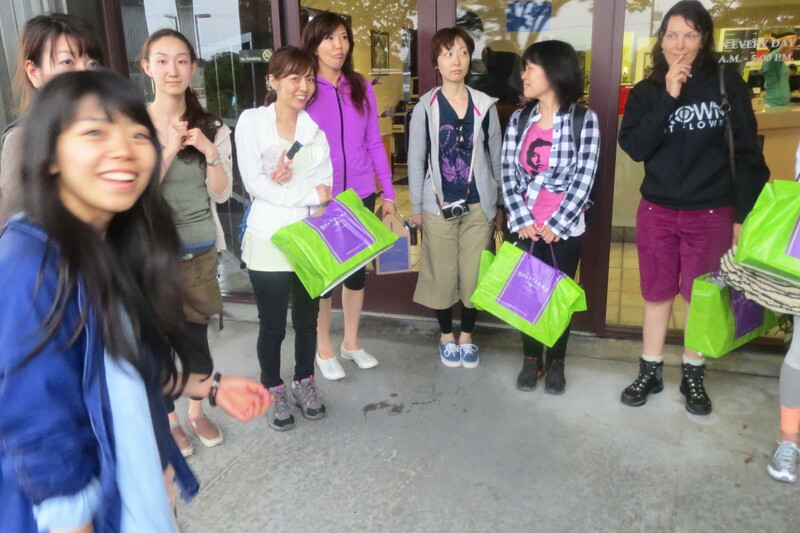 Due to a busy schedule teaching abroad, I referred the class to another colleague last year. I recently came across these images from the last week in July 2013 that I wanted to share. ( There is also a earlier post from summer 2012 that you’re welcome to look at). Overall, It’s been rewarding to expand my scope as a yoga teacher through experiences with new audiences that inspire learning and discovery. Dancers, although extremely athletic and gifted with incredible body awareness can definitely benefit from the practice and study of yoga which especially provides for this audience: a therapeutic approach for injuries; practicing restoratives, pranayama and meditation to balance their nervous system; and an opportunity to explore new movement; and to perform classical ballet poses with mindfulness. The dancers can also be inspired by exposure to something new–many of the students I’ve taught over the past summers have inquired about becoming yoga teachers or have dropped into some of my classes at Yogaworks. They too recognize the opportunity to enhance their careers or necessity for the continued study and practice of yoga. 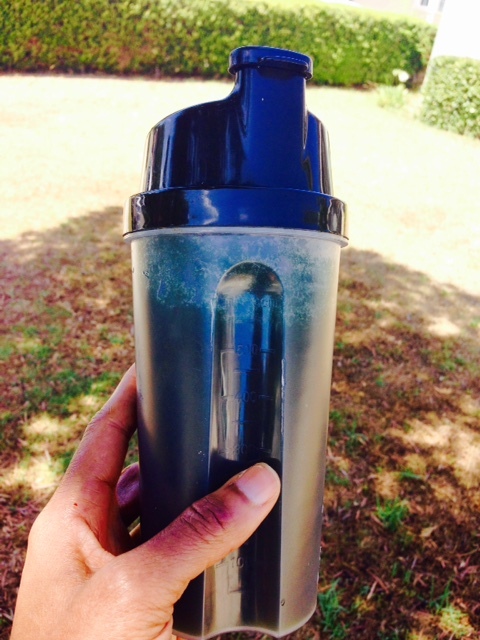 My Handcrafted Natural Energy Drink! The life of a yoga teacher can be more physically demanding than people realize. For example, I practice Ashtanga 5-6 times a week and teach up to 15 yoga classes a week. Yet, in spite of my best efforts to eat balanced nutritional meals and drink lots of water, I have shown alarming physiological signs of nutritional depletion. I stopped into Co-Opportunity, my local, organic market and health food store, and had a chat with Ken Ohashi, (Assistant Wellness Manager). He said that my grueling practice and teaching schedule was draining my body of essential minerals and nutrients and suggested a few natural food sources for supplementation to help with rehydration and replenish the electrolytes, vitamins, and minerals that are lost through excessive perspiration. I told him about the concoction I was already drinking in the morning–coconut water, lemon, lime, water, chia seeds and a scoop of collagen with Vitamin C. He said that blend was okay but I could use something more potent. 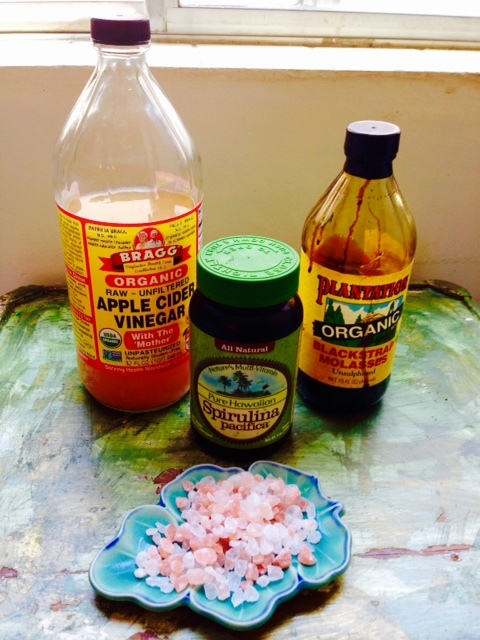 He recommended: Himalayan Pink Salt, Organic Unsulphured Black Strap Molasses, and Apple Cider Vinegar. Furthermore, he said, I was most likely stressing my adrenal glands and the physical symptoms I described were signs of excess cortisol production. He then also recommended an herbal blend formula to help support the adrenal glands (with Holy Basil, Siberian Rhodiolia, Ashwaganda Root, Wild Oats Milky Seed, Schisandra Berry). I purchased all the ingredients and immediately went home to make my first batch. In addition, I decided to do a little research on the food sources he recommended and was surprised to find out how powerfully sustentative they were and concluded that, yes, my body was indeed short on many key nutrients. After sipping on this homemade concoction for about a week, I decided an ingredient was missing so I added Spirulina, which made the brew just right! I’ve been consuming this handcrafted energy drink for a couple of weeks and I’m feeling much better. I’m also noticing some positive changes: sustained energy throughout the afternoon; calmness and mental clarity; feeling less tired when waking up in the morning, and some of the physiological symptoms seem to be dramatically reversing. This homemade beverage is better than many of the energy drinks on the market, which are loaded with chemicals, sugar or artificial sweeteners, caffeine, and artificial coloring. My homemade superfood elixir is also substantially less expensive, costing just pennies for the many ounces I’m drinking per week! I make this blend to drink in the afternoon, either after my practice or when teaching back –to- back classes. It’s actually very pleasant tasting and has a subtle richness almost like chocolate and just as satisfying. In fact, I’m craving less sugar in general. I drink this instead of consuming a typical sweet snack in the late afternoon (chocolate, popcorn, trail mix) all of which have more calories. Put all the ingredients in a sealed container and let sit until the salt is dissolved. Shake and drink. When you are left with about 1oz of residue at the bottom of your container, refill with water and drink the rest. Enjoy! Himalayan Pink Salt: Apparently, there are 84 trace minerals in pink salt including, potassium, magnesium, calcium, sulphate, and sodium chloride. Among its many benefits when ingested, pink salt can help with hydration, muscle cramps, replacing key minerals lost during perspiration. Although the benefits of Himalayan Pink Salt are debated in some sources, I’m willing to try this for a while to see the results. Organic Unsulphured Black Strap Molasses: I vaguely remember black strap molasses from my childhood. My mother would give us a spoonful now and then saying it was high in iron, explaining that she was given this a supplement when she was a child. This dense, dark syrup is the residue of boiled down sugar cane, and is high in iron, as well as calcium, magnesium, potassium, copper, manganese, selenium, chromium, B-vitamins and protein. Black Strap Molasses is an overall health tonic with many vitamins and minerals that are antioxidants that help the body with energy and cell-production, as well as, calm the nervous system. Although 1 tbsp. provides a multitude of nutrients, it also has 13 grams of sugar—(please consider this if following dietary restrictions). I’ve been too active to experience weight gain from the sugar in this drink. Furthermore, since I’m extending my recipe out over two 20 ounce containers, I’m essentially diluting 13 grams of sugar in 40 ounces of water. Apple Cider Vinegar: Apple cider vinegar is rich in minerals, like potassium, sodium, chloride, phosphorus, calcium, and magnesium, and trace minerals, like, copper, fluorine, as well as vitamins A, B1, B2, B6, C, and E, bioflavonoids, and pectin. I prefer to use “Bragg’s Apple Cider Vinegar” which has a significant amount of “mother” the beneficial enzymes and bacteria that settle at the bottom of the bottle. Spirulina: Spirulina has significant amounts of Vitamin A, calcium, niacin, potassium, magnesium, B vitamins and iron. It also has essential amino acids (protein) and antioxidant health benefits, which have been proven to aid in the body’s recovery from excessive exercise. In July 2013 my YogaPlus colleagues from Tokyo, Kenichi Nemoto and Keiko Tanaka, made their first trip to Los Angeles to visit various Yogaworks studios. 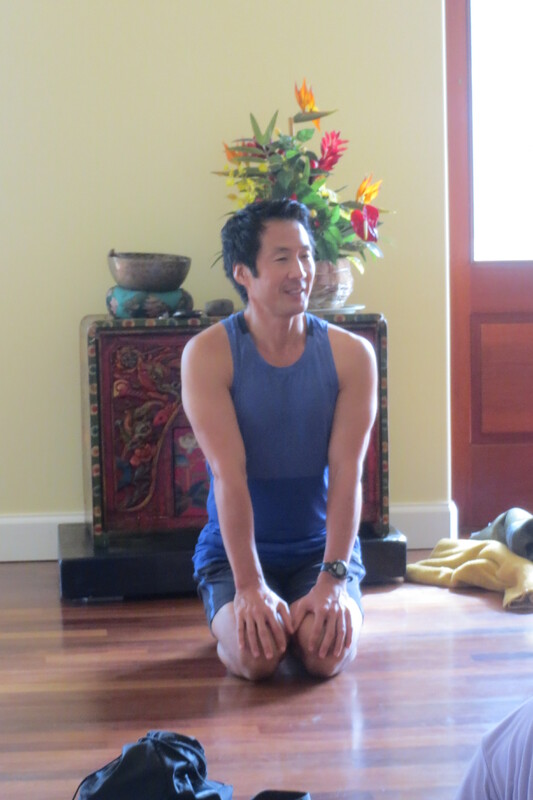 Kenichi (Ken) a student in my first TT in Tokyo (2012), is now a very popular teacher at Yogaplus. Tall, talented, and a former professional vocalist who notably performed in a touring company of “Phantom of the Opera.” Keiko Tanaka, whom passionately oversaw the expansion of the Yogaworks trainings at YP, was the quintessential programming director. They were encouraged to come to LA and experience the thriving yoga community here and spent a glorious week filled with an intensive program of classes at a number of Yogaworks studios in Santa Monica (Montana Ave. & Main St.), South Bay, Westwood and Hollywood; and mandatory sightseeing. Food became a secondary focus, although Californian fare isn’t as stellar as Japanese cuisine, there are plenty of popular spots in L.A. On our fist evening together we had dinner at Annipurna, a popular vegetarian restaurant in Culver City. Pumpkin Pie at Urth Cafe became one of our favorite treats–their salads were second best. Ken also insisted that we try Unami Burger—Unami is the “fifth flavor”–which often is the secret undistinguishable essence in a dish that makes it delectable. Additionally, Ken and Keiko had their fair share of ubiquitous Mexican food, claiming they ate more tacos and burritos than they could stand, but we insisted they try Wahoo Fish Tacos. We were able to squeeze in our last lunch of wholesome sandwiches at Fundamental. For more fun, Ken and Keiko toured the city from Hollywood to Venice Beach. One evening we drove up and down the mountainous Malibu Canyon Road and then headed north on Pacific Coast Highway towards Pt. Dume, where we spent a fantastic evening hiking the bluffs, then viewed a spectacular sunset over the Pacific Ocean. 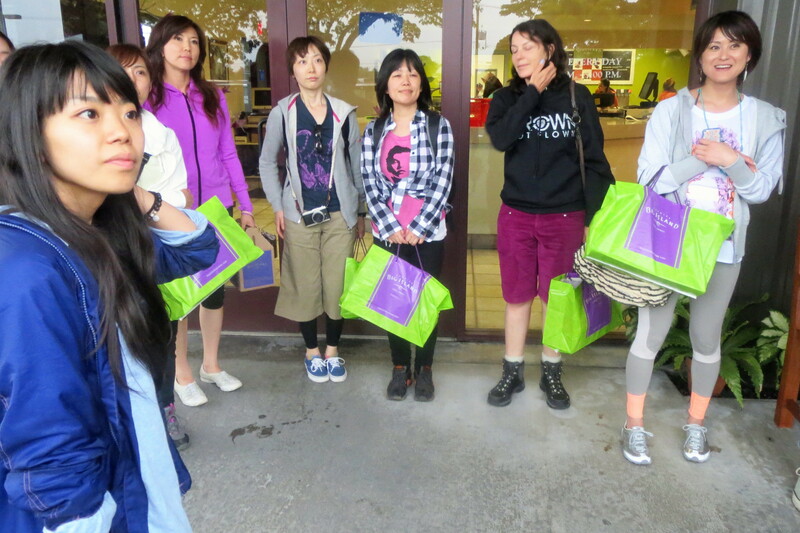 In all, Keiko said that she was impressed by robust yoga culture in Los Angeles, which is diverse in many ways: people of all ages and backgrounds practicing yoga; lots of men, not just women taking classes (which tends to be the case in Japan). They were both very surprised to the large audience of yogis attending filled classes here at each studio, literally back to back. 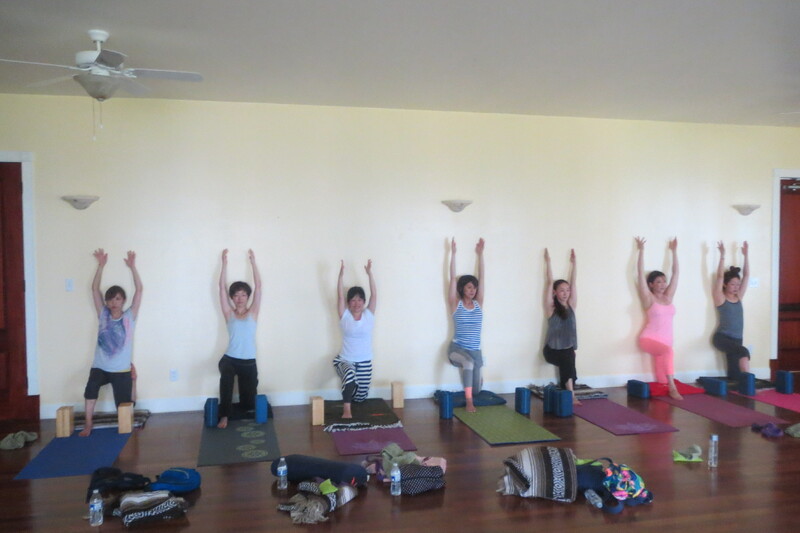 I told them that yoga is part of the mainstream environment in Los Angeles, with so many choices of styles at dozens of studios, and of course great teachers, it makes it impossible to not to pick up your mat and participate. Once people see the benefits of consistent practice, they keep going. Furthermore, the studios become a social outlet and mini-communities are formed. I was delighted that Ken and Keiko were able to visit Los Angeles and gain insight on how they could positively influence the yoga program at their studio in Tokyo, recognize the growing potential of partnerships, and the abundant opportunity for collaborations. Meet Me In Calgary Or Beijing! I interrupt the flow of story telling to announce two upcoming 200Hr Yoga Works, Teacher Trainings that I will be leading in Beijing, China; and Calgary, Canada. These locations are a fortuitous departure from my intriguing annual trainings in Tokyo, Japan and I welcome this chance to expand my international scope as a yoga teacher. Furthermore, I will be in Calgary this weekend to host a “Meet the Trainer” event at Beyond Yoga, April 18, 2:30 – 4:30 p.m. I’ll teach a brief Yoga Works style class, which will be followed by a Q & A about the upcoming training to be held there in July. 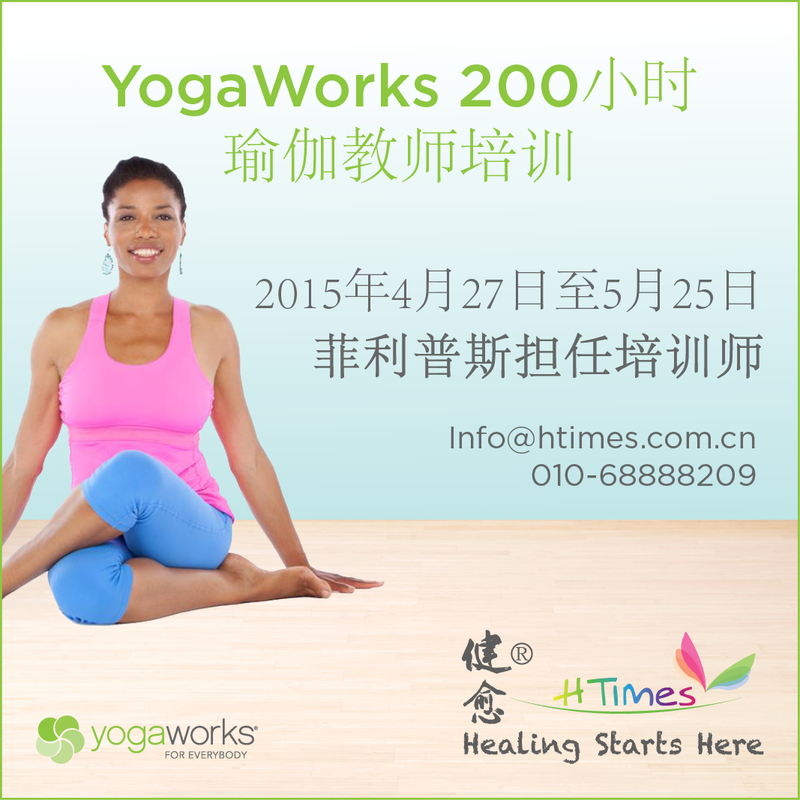 The training in Beijng starts, April 27 – May 24, 2015–will be led by me in English with a Chinese translator at HTimes studio. 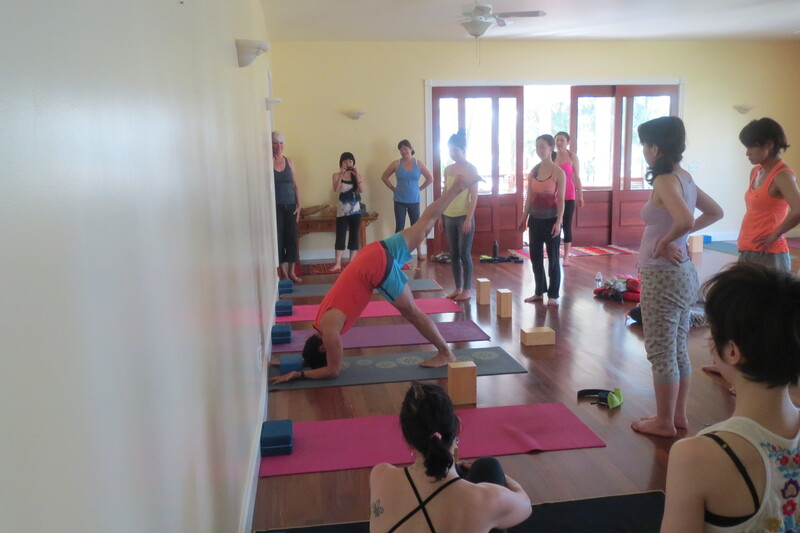 Yoga Works Teacher Trainings are growing increasingly popular at partner studios around the world. For readers who happen to live in these areas, please feel free to join me or spread the word! An orchestra of crowing roosters woke me up at sunrise, so I decided to walk the grounds before meditation class, taking in the freshness of the garden in the cool damp morning and glint of sunrise lighting up the center with dazzling rays. After the morning practice and breakfast, the group of us hiked down to the center’s private beach. An enormous steer emerged out of the pines and accompanied us for a while as wild hogs darted in and out of the brush. Finally arriving at the beach, we paused for a moment to look out onto the shore, and then took yoga shots on the rocks. The afternoon was free time and many of us swam in the glassy saltwater pool, lounged, or started packing. Later that evening Mo made a special celebratory gourmet vegetarian dinner including a special gluten-free chocolate cake. We dressed up in our finest tropical wear (some items purchased in Hawi or Hilo) to commemorate our adventurous week together. Friday morning, May 24 was spent squeezing in a final meditation practice and then checking out. Joyful goodbyes were exchanged and after shuttling people back and forth to the airport throughout the afternoon, a handful of us traveled down to Kona to take in a few more sights before departing later that evening. This was my first international yoga retreat, daring and elaborate to organize, it was hard to imagine such an incredibly successful outcome. Yet, the results seemed effortless thank to David Kim my colleague, who was a seasoned pro at organizing such feats. I would learn so much from him that ultimately boosted my confidence as a teacher and retreat leader, but most of all, I learned how to appear gracious under pressure and how to be the greatest host. As yoga teachers, we not only guide and inspire people to learn, but in situations like this, we are leaders and guardians who can create a magical experience that touches people in a significant way. Overall, our 5-day retreat—was a real Hawaiian Odyssey. 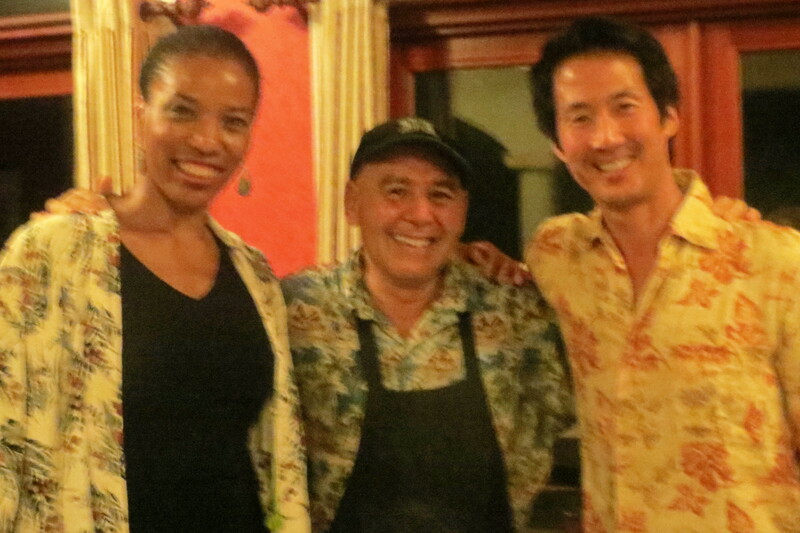 We were able to merge diverse cultures from two great cities, Tokyo and Los Angeles, and share a broad range of exciting sights, delicious cuisine, myths, stories and many other cultural pleasures offered by the Big Island of Hawaii. It was also great to have the participation of the growing Japanese yoga community that David and I are part of, including our energetic translator, Yuri Nakamura Hayashi and Yoga Plus Manager, Keiko Tanaka who coordinated important details back in Tokyo. I felt as if we had truly immersed ourselves in a healthy, balanced program of daily yoga practice, mediation, healthy food, sight-seeing excursions, to benefit tremendously from an amazing transformative experience. Yoga retreats can range from intense, challenging to relaxing and restorative, thus allowing people to create a special bond. We weren’t just traveling tourists residing at a commercial resort–our splendid and generous host, Jeannie and the HIRC provided a marvelous setting to offer something rare and exclusive. I would later hear how many of the participants on our retreat were inspired to continue to develop their practice, pursue teacher training, or even make healthy improvements in their diet. David and I were also very pleased that lasting friendships were formed among us. Volcanoes National Park, 30 miles south of Hilo, is the location of two of the world’s most active volcanoes, Kilauea and Maunalua. This approximately 300,000 acre park, features a diverse environment of terrain– from dense rain forest to dry, arid desert dotted with strange flora that is uniquely distinctive to this natural habit. It has been classified as both, a “Biosphere Site” and “World Heritage Site” by UNESCO. We started with a quick trip though the 500 year-old Thurston Lava Tube, walking down a narrow wooden bridge into a dimly lit tunnel of hardened lava, then exiting out into a dense, moist rainforest of ohia and colossal and fantastic Hapu’u ferns which I had never seen before. Later we went to the area surrounding the Kilauea Caldera, the home of the volcano Goddess Pele who lives on the site. She “governs the flows of lava” and is the “goddess of fire, lightning, dance, volcanoes and violence” (1) and figures prominently in Hawaiin mythology. I really admired the enchanting murals narrating the history of the Islands and the goddess Pele on view at the Kilauea Overlook center. Plumes of steam wafted up from the wide, increasingly large crater which contents glow at night. The most recent eruption was in March of 2008 and since then periodic lava flows have streamed down Kilauea’s southeastern shore, covering acres of land with slag and destroying many structures and roads in its path. After walking among the peculiar landscape taking pictures and amusing ourselves in the chilly wind, we raced off—making it to Big Island Candies just before they closed! This heavenly fragrant chocolate factory creates thousands of delicacies in countless varieties: chocolate macadamia nut cookies, brownies, chocolates made with locally grown macadamia nuts, Hawaiian Ginger, guava and Kona coffee. Everything comes wrapped in cheerfully colored boxes. Each and everyone of us left with huge bags filled with gifts that would soon be ravished by friends and family back home. Big Island Day Trip: First Stop Hilo! Our retreat featured a grand expedition that would take us to the eastern coast of the island to visit the bustling Farmers Market in Hilo, Volcanoes National Park and Big Island Candies. I started the day off with an invigorating yoga class with handstands (Adho Mukha Vrksasana) as our peak. Once again, Mo packed up special meals for us to take on the road since we would be gone all day exploring sites on a tight schedule. We loaded up the vans and headed out on Highway 200 traveling about 80 miles (2 hrs) across the Big Island to the densely populated city of Hilo where the lively market was in full swing. We were joyfully struck by the vibrant medley of produce –lychee, bananas, squash, melons, pineapples, musubi and more fruits and vegetables that were exotic to us but native to the island. There were also flowers of all kinds in dazzling colors, including orchids and anthuriums. 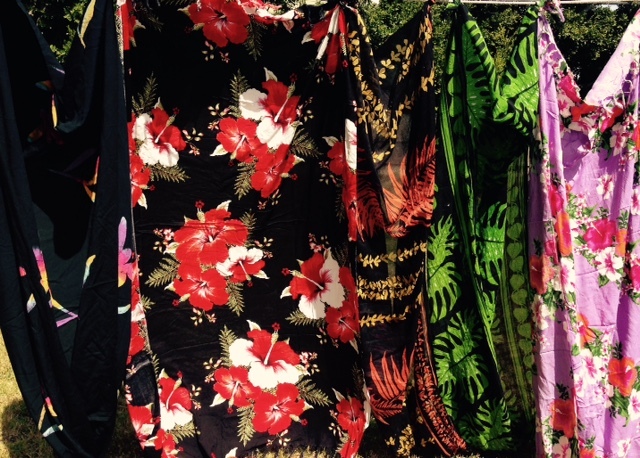 Handmade crafts, jewelry and clothing suitable for the tropical environment filed the outer lying stalls. Everyone left the market with bags loaded with treasures and I couldn’t resist the pareros buying more to add to my growing collection! After our morning program, we decided to stay on the North Kohalo Coast and spend the afternoon hiking in the spectacular Pololu Valley. After driving north of the center on Hwy 270 through Kapa’a, we parked our vans and began our descent on the trail, taking a moment to gaze at the vista from the Pololu Overlook and take in the dramatic coastline of black sand contrasted by a lush and serene terrain. I found out that some scenes from the movie Jurassic Park were filmed here, I can see why–the sweeping landscape, with steep sloped emerald-green valleys with misty clouds hovering above, appeared surreal: like a lost forbidden land that would most certainly reveal spectacular surprises, such as, prehistoric dinosaurs, if you were to venture into it. We continued down and lingered around the coast, walking along the rocky beach. Rough surf swept in and literally knocked Julie from her feet! Afterwards heading back up, we made a short visit to another nearby town—Kapa’au and took a picture with the great Hawaiian Chief Kamehameha I who was born in the nearby Waipio Valley and was courageously responsible for uniting the Hawaiian Islands in 1810. A brief time was spent walking around the few shops in tiny and charming town of Kapa’au –but we made a unanimous decision to swing by Hawi for ice cream at Tropical Dreams. Later on that day, I led a backbend workshop, which was followed by wonderfully delicious dinner. On the second day or the retreat after a full day of: morning class, a visit to Hawi, and an afternoon Inversion workshop led by David, we headed off to the Mauna Kea Observatory around 4:30 p.m. Mo packed some snacks in our coolers and we bundled up in layers in preparation for the frigid temperature at high altitude. 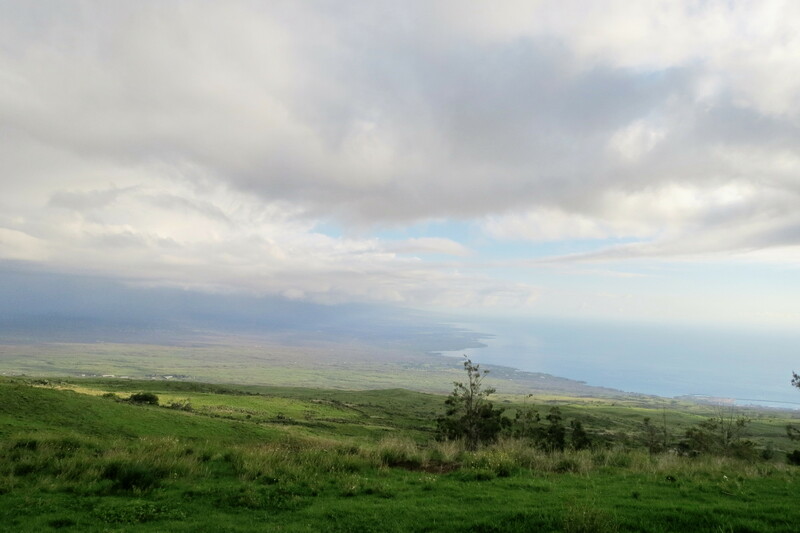 We drove off on a scenic Highway, 200, which cuts across the middle of the island, inching higher and higher to the top of the Big Island as darkness fell. Ascending slowly to Mauna Kea, which is 13, 796 ft. above sea level, the landscape noticeably changed to vast desolate acres of lava, stark, lunar like and barren. Mauna Kea (White Mountain), which Hawaiians refer to as the “sacred realm of the Gods,” is a dormant volcano and the site of the world’s largest astronomical observatory. It is also the highest island mountain in the world and the highest point in the Pacific Basin. 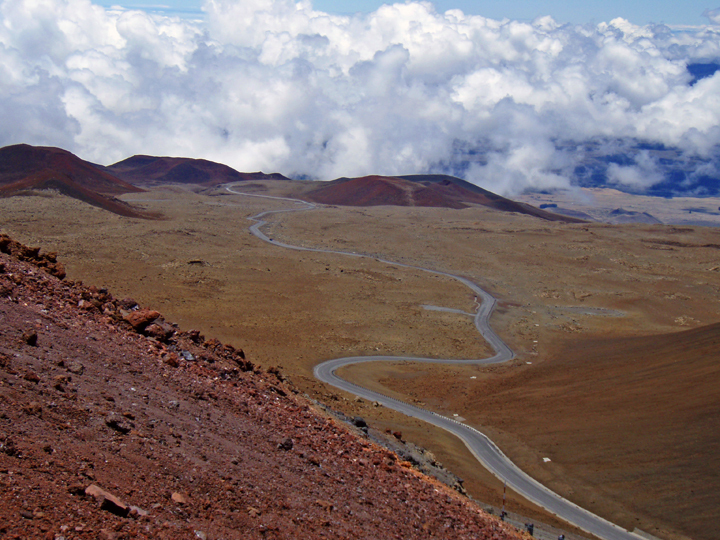 The summit of Mauna Kea is above 40% of the Earth’s atmosphere. The extremely dry atmosphere is cloud free, inky dark sky, making it ideal for observing the faintest galaxies that lie at the very edge of the universe. Night viewings are held at the visitor’s center. Towards the end of our long drive, David called me on his cell phone to tell me that his van was out of gas and running on fumes! We inched our way up to the visitors center at 9,000 ft. Luckily the camp at the top gave us enough gas that would help us make it back to Waimea! Shivering in the bitter cold and windy night, we meandered around the visitors center to peer through a handful of telescopes that were set up and directed towards brilliant stars and planets. Apparently 85% of all stars visible from the earth can be seen here. Peering through the various telescopes I saw: Saturn encircled by rings, Venus, and the Moon, which loomed so large and close, we could almost touch it! An astronomer pointed out the many constellations in the night sky with a laser. We made the long trek back to the retreat center, arriving there sometime after 9 p.m. I had never been to the Hawaii Island Retreat Center and therefore didn’t know what to expect. With just a few glossy promotional images to rely on, I put my trust in David who assured me that all was good. Yet, to my surprise, the stunning, rural setting and uniqueness of the property far exceeded my expectations. Overall, the HIRC turned out to be an exceptional contrast to the pricey, massive commercial resorts on the Big Island. 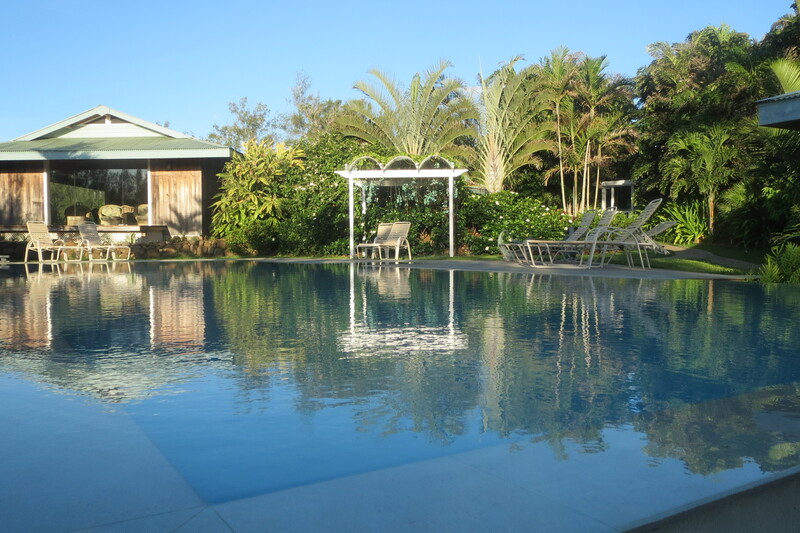 Situated on the North Kohola Coast, two miles of Hwy 270 outside of Hawi, The Hawaii Island Retreat Center is owned and managed by Jeanne Sunderland and Robert Watkins who spent years building this impressive oasis with the help of their two children. Jeanne said that she and her husband purchased the 50 acres with a vision of creating a sustainable farm and retreat center. It then took over 10 years to draw up plans, acquire permits and then start construction. The center is powered by its own windmills, solar panels and water provided by natural springs. Jeanne and Robert have a congenial staff of talented people who keep up the vast facility, gardens and animals. 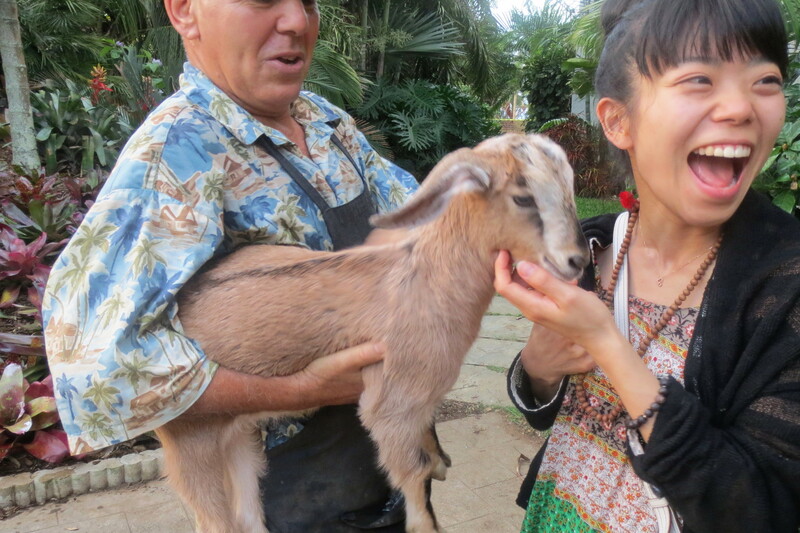 Mo, Yuri and a rambunctious baby goat! All of the food that is eaten at the center is grown on the property. Free roaming goats and chickens provide fresh goat milk, cheese and eggs. In addition, large steer, cattle and wild pigs scampering about, however since meat is not served, I think they are just guest who love living on the land! Jeanne also said that she is hosting a program that supports organic gardening. An abundant variety of fruits and vegetables are served daily–including, mangos, papayas, lychee nuts, bananas, pineapples, avocados, eggplants, lettuce and other greens. Exotic flowers were growing everywhere, from plumeria to flora I’d never seen. The main house has a “Colonial Plantation” feel, with open verandas, dining and living rooms. Even “Yurt Village” was stylish and equipped with bathrooms. I really enjoyed staying in my yurt in a remote location near the pool and hearing the natural wonders in the darkness of night–rain, birds and other wild animals. A resounding chorus of chirping birds and crowing roosters would wake me up at sunrise. We ate our meals in a richly painted red airy dining room decorated with beautiful antiques and paintings. The table was always set impressively with white linen table cloths for dinner. “Mo” our chef from Morocco would whip up tasteful vegetarian meals with flair. Jeanne gave us a tour one evening and told us about the amazing history of the site also called “Ahu Pohaku Ho’maluhia” (Place of Healing Stones) due to the culturally relevant ancient stones dotting the property: the primeval stone circle where Hawaiian Chiefs once congregated and held council; the magical fertility rock that women from near and far would come to sit on as part of ritual in hope of bearing a child; and the stone amphitheater for hula performances and concerts held long ago. There were also the mystery of two old massive stones that found their way down a hill to line up perfectly. These legends dated back centuries and Jeanne allows traditional Hawaiian ceremonies to be held among the revered stones. It is possible to stay at HIRC for many reasons: yoga, silent and meditation retreats, writers and artists also make extended visits to work on projects. There were even a pair of young newlyweds on their honey moon who joined us for dinner occasionally. With 50 acres of idyllic tranquility available, it is possible to lodge at the center for days and not leave–everything you need is right there.